One of the best selling albums of 2003 and a top 10 album of the entire 2000s decade, Fallen the debut album by Evanescence had those amazing ballads by Amy Lee, that transcends time. "My Immortal","Bring Me to Life","Everybody's Fool" and "Going Under" rocked the charts for a period of 48 months starting March 2003. They flooded the 2004 Grammy awards with five nominations and managed to win two of them, including...Best Hard Rock Performance of 2004 and Best New Artist of 2004. 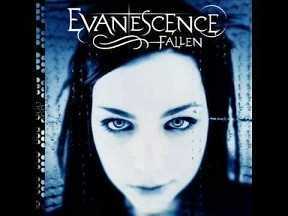 Fallen was released by the Christian record label Wind-up Records and the Christian radio stations across the U.S started promoting Evanescence as a Christian band but after listening to the lyrics of "Bring Me to Life","Going Under" and "My Immortal" many started wondering if Evanescence is Christian at all. The album title Fallen, was not well received by the Christian groups in the U.S nor does the music video of "Bring Me to Life", where Amy Lee, the bands lead female singer was seen jumping off a building,with many critics calling Amy Lee..someone with suicidal thoughts. But still... "Bring Me to Life" received heavy air play in Christian radio stations across the States at the same time those who opposed them, grew in numbers as well. By mid 2005 Evanescence songs were more popular with the many pagan cult groups in the States that worship the dark entity than with the Christian groups. Finally Wind-up Records Chairman Alan Meltzer pulled the plug off the Evanescence songs across all the Christian and Gospel radio stations in the U.S,requesting them to not play Evanescence anymore. Till date no one knew why Evanescence recorded songs such "Bring Me to Life" and "Going Under", titled their album Fallen when they knew very well they were signed to a Christian record label Wind-up Records and were requested to create music glorifying the almighty. In a 2006 interview, Amy Lee confessed that it was Ben Moody, Evanescence guitarist who was responsible for this mess as he always wanted his band to be associated with the Christian groups but she always opposed this notion, but Ben went on and on promoting Evanescence as a Christian band. Christian or secular never mattered much for Evanescence fans who swelled in numbers ever since their debut album Fallen was released in 2003. Fallen sold 17 million copies across the globe, was certified multi-platinum in the U.S with more than 7 million copies sold,another 3 million coming from Europe..while Australia,Canada and Mexico raked in another 1.5 million copies in sales. Inspired by the desire to make the most out of life, “Bring Me to Life” is from Evanescence’s (rock band) studio album Fallen. It was released on April 22, 2003, by Wind-Up records after being produced by Dave Fortman and written by Amy Lee, David Hodges, and Ben Moody (the rock band members). According to Lee, the track comes with several meanings and inspiration that were inspired by her husband Josh Hartzler. The track received commercial and critical success which saw it topping in Australia, Italy and UK followed by being top ten in various countries including the United States. Having been included in a thrilling series Daredevil soundtrack, “Bring Me to life” went from being a top song to a Platinum certified track by RIAA and ARIA. It won the Grammy Award for Best Hard Rock Performance and Billboard Music Award for Soundtrack Single of the Year. On August 13, 2013, the rock band performed live in Chicago during their Nintendo Fusion Tour, at the Webster Hall, NY in September 2003, and during the 2011 Rock Festival in Rio on October 2, 201,1 among others. The music video was directed by Phillip Stolzl and was a huge success that led to Amy receiving some film offers and a nomination at the 2004 MTV Video Music Awards for Best Rock Video. “Bring Me to Life" has over 421 million YouTube views with over one million plus copies sold in the United States only. Four years ago according to TMZ, Amy Lee (group member), sued the Wind-Up records over unpaid royalties plus other claims. The band’s studio album Synthesis has fans itching for November 10, 2017, when it is supposed to be released. Though the group suffered Ben Moody’s departure in 2003 and the exit of Terry Balsamo, the group is still strong and rising to new heights.